Left Coast Naturals > Left Coast Naturals > Community Kudos > Hippie Foods Garden Chips awarded Product of The Year! What you REALLY thought of Hippie Garden Chips. Your reviews! Hippie Foods is now Hippie Snacks! 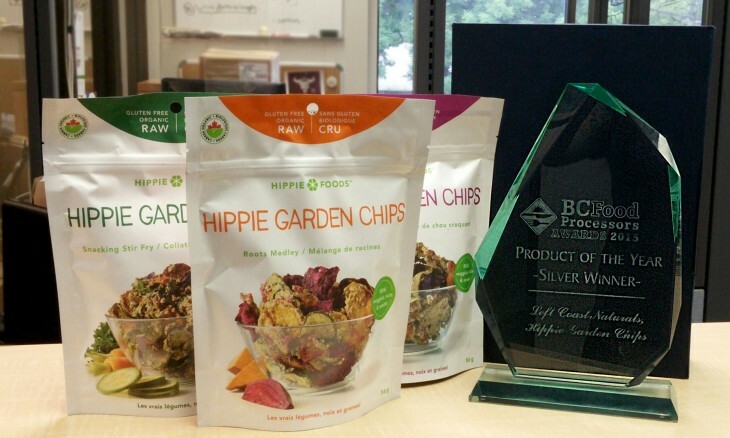 Hippie Foods Garden Chips awarded Product of The Year! We are honoured that our Hippie Foods Garden Chips have been awarded Product of The Year – Silver from the BC Food Processors Association from a field of over 20 great nominated products. In a Dragon Den’s style atmosphere, 20 local food companies were given two minutes each to pitch their product at this year’s BCFPA Taste Test event. Held at Quest Food Exchange, the panel of esteemed judges then scored the product based on taste, innovation, marketing, packaging and environmental impact. In 2014 Hippie Snacks Coconut Chips were awarded Product of The Year – Bronze. Hippie Garden Chips are a raw, nutrient dense snack made from slices of real organic veggies that are tossed in a dressing of nuts and seeds. They are Certified Organic and Non-GMO Project Verified as well as Gluten Free. They can be found in stores across Western Canada. Thank you again to the BCFPA, the judges and all the wonderful nominated products.